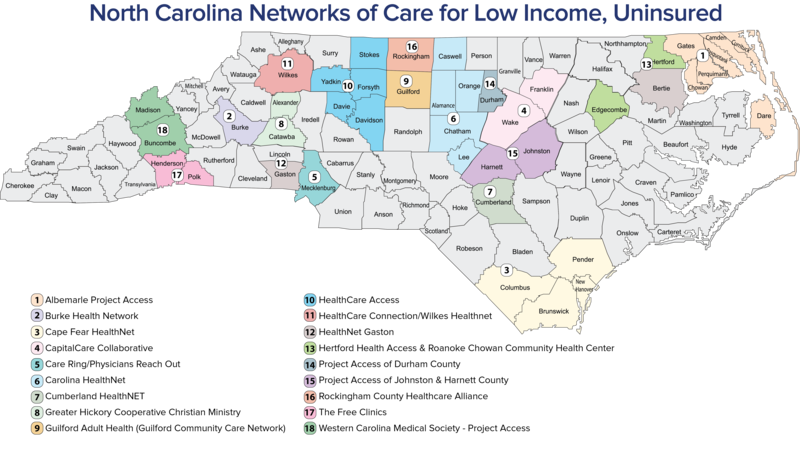 The North Carolina Hospital Foundation provides technical assistance to 18 community-based networks of care across the state providing access to coordinated primary and specialty healthcare services for the low-income, uninsured. Networks are composed of a broad range of healthcare providers and other health-related resources working in collaboration to leverage resources and align services. These provider networks provide medical homes and ensure timely, affordable, high-quality healthcare services for underserved North Carolinians, ensuring that these patients get the right care in the right place and at the right time. Network partners include hospitals, free clinics, certified rural health clinics, community health centers, physicians, medication providers, behavioral health providers and local health departments.